The idea is to still take advantage of the intel/report system, but add prices as a first-class citizen – something that gets reported on, and something that has a specialized way of being displayed. Price updates come in from all over the Sector, with more updates coming from the star system the player is currently in, and more updates coming from a star system where the player has hacked a comm relay (and thus, presumably, has access to more information). In addition, news reports and such can have price updates attached to them. For example, a report about a trade disruption or a food shortage will always give the player new price information for the affected commodities. Finally, when you trade with a market, you get price updates on commodities with particularly high or low prices. You might be wondering, “but can’t the player get perfect information about prices by looking at them while trading with a market, information that these price updates don’t provide?” Yes, they can. At first glance, this seems like a problem. We want to avoid a situation where the player can get a leg up by traveling around the Sector and manually noting down all the prices. Fortunately, that’s not very practical due to travel time and expenses. Price information is time-sensitive – you’d be better off taking advantage of an already-known route than spending time trying to find a better one. And so, we have the basis for trade: relevant pricing information being available to the player, in a (hopefully) easy-to-process way. Why smuggle rather than trade openly? 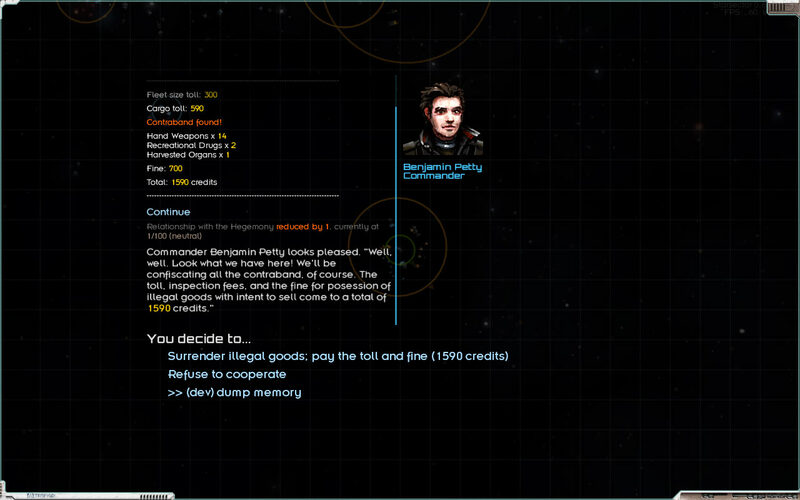 In game terms, “smuggling” means selling goods on the black market. There are two advantages to this. One, you don’t have to pay the standard 30% tariff. Two, you can also trade in goods that are illegal to buy or sell on the open market, which tend to have higher prices and so frequently have higher profit margins. Of course, smuggling has its downsides. Trading on the black market is going to damage your reputation with the faction owning the market. Mixing in some open-market trade can cancel this out, as can other reputation-preserving activity such as, say, bounty hunting. 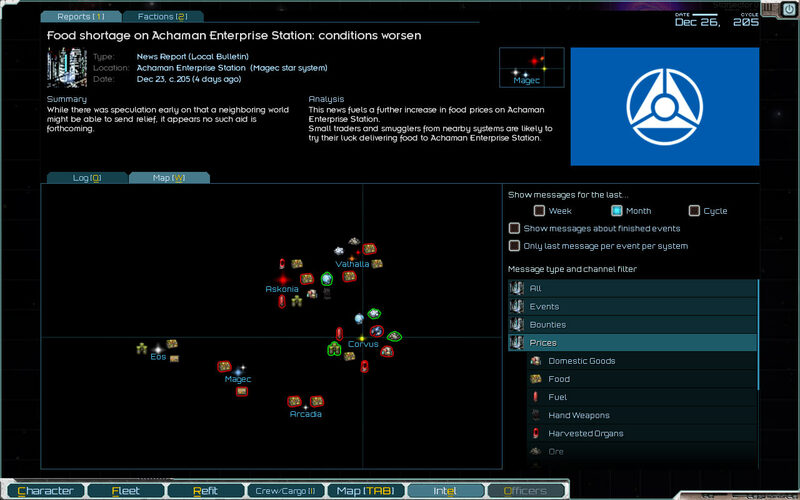 Leaning too heavily on smuggling is going to make it more difficult to carry out – patrols will stop you more frequently, markets will refuse to trade with you (though you’ll be able to trade on the black market still – provided your fleet is small enough, and no patrols are around), and you run the risk of the faction becoming outright hostile. It’s also going to destabilize the markets you’re trading with, particularly if they’re small – leading to lower prices and reduced profits. Or, possibly, increased profits, if the destabilized market is where you’re buying rather than selling. A particularly profitable form of smuggling is when you’re trading across enemy lines. For example, in the Corvus system, the pirates (or, as they might call themselves, “tax-free operators”) have set up small mining compounds on both moons of the system’s gas giant, Barad. 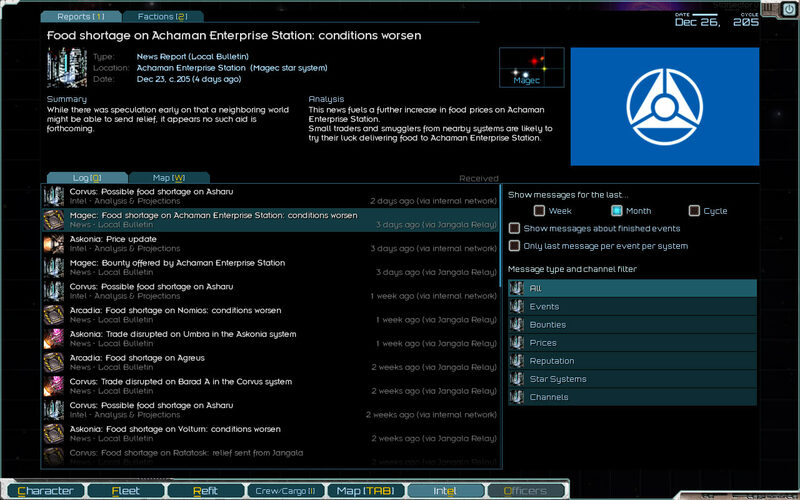 Buying ore and volatiles there and selling them elsewhere is very profitable, since there’s no regular trade between pirates and anybody else, and the prices generated by the economic simulation reflect this. Trading with pirates is a sure way to tank your reputation with other factions, though, so the risks rise to match to increased reward. Occasionally, a patrol may decide to stop your fleet and perform a customs inspection. You can try to avoid it – avoiding it is actually easy if your fleet is fast, but avoiding it without a reputation penalty takes a quick response and a fast fleet. The odds of being stopped are much higher if the faction doesn’t like you very much, and as smuggling reduces your relationship with a faction, more frequent customs inspections are a natural consequence. The patrol performs a cargo scan, which has a chance of detecting any contraband you’re carrying, “contraband” being defined as anything deemed illegal by the patrol’s faction. The patrol also assesses a toll – and a fine, if contraband was found. Mr. Petty, customs inspector. I see the random name generator believes form should follow function. You gain some reputation by cooperating, and lose some by evading or, worse yet, refusing to comply once contraband is found. What role does this mechanic play in the larger design, you ask? Good question. A large part of this is flavor – smuggling without the chance of being caught by a patrol just doesn’t feel right. Mechanically, it’s an extra, more interactive risk added to smuggling. Having smuggling be purely penalized by reputation loss felt a bit dry. It’s also a way to reward higher reputation with a faction. The chances of being stopped drop quickly as reputation levels go up, as do the chances of contraband being found (either the inspectors are “looking the other way”, or they simply aren’t as thorough with someone they trust to some degree). Finally, it’s a risk added to regular trade, and a way to make smaller ships a little more competitive – an Atlas superfreighter may carry a huge amount of cargo, but it’s not going to be running away from a customs inspector in a frigate any time soon. 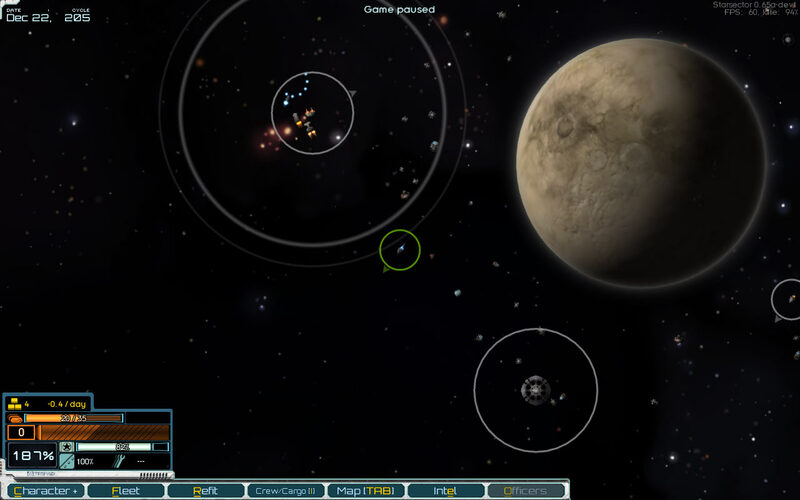 A small fleet (small enough to sneak into a hostile market – as of this writing, up to 1 destroyer and 1 frigate, or 3 frigates), smuggling to/from pirate-controlled markets. Fast money, cheaper to get started, but a high reputation loss, higher still if evading customs inspections regularly. 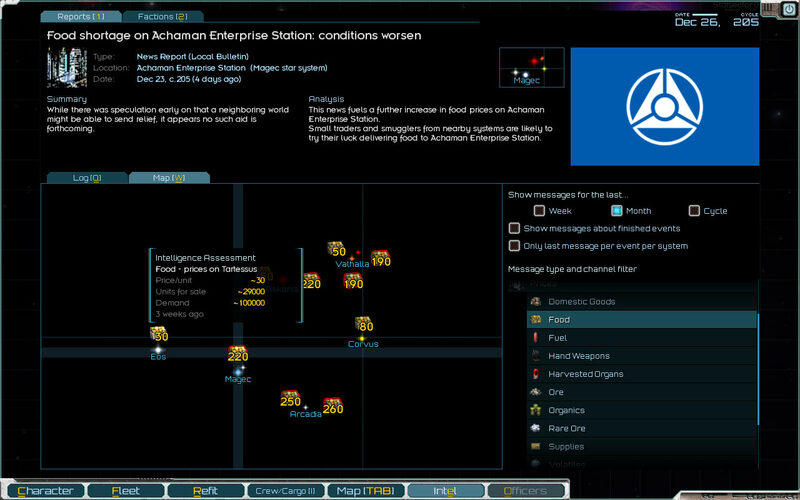 A larger fleet, trading mostly in legal goods and smuggling opportunistically. Essentially trading in reputation for money, by occasionally selling on the black market and/or evading authorities, but staying just on the right side of the law in the end. A larger fleet, engaging in legal trade. Less profit, more tolls, but better relationships all around, and more stable markets – which, in turn, lead to better ships and weapons being available for sale. Gains depend more heavily on taking advantage of events to get higher margins. Of course, other styles should be possible, too. The above are just the basic ideas, and the details of what kind of playstyle works and how will certainly change due to other mechanics interacting with these. This entry was posted on Monday, August 25th, 2014 at 7:08 pm	and is filed under Development. You can follow any responses to this entry through the RSS 2.0 feed. Both comments and pings are currently closed.